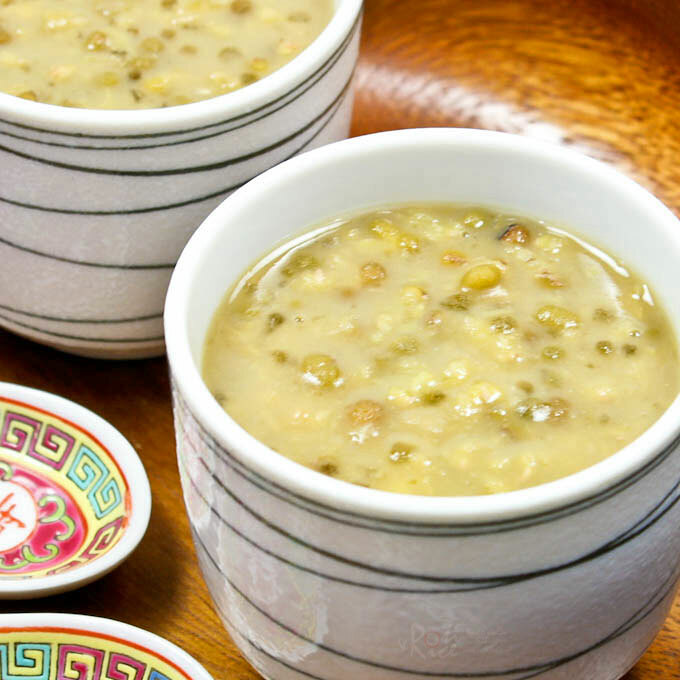 This Sweet Mung Bean and Sago Soup is a Chinese dessert with a Southeast Asian touch. Pandan leaves, sago, and coconut milk makes it even more flavorful. The Chinese have a whole range of sweet soups. Known as tong sui in Cantonese, these soups are usually served at the end of a meal. They are light and refreshing making them wonderful low fat summer desserts. Most are served warm but some are delicious chilled. Mung beans, also known as green beans are small cylindrical beans with a bright green color. They can be used whole, split, or hulled. Whole beans are usually boiled. They are also germinated to produce bean sprouts. 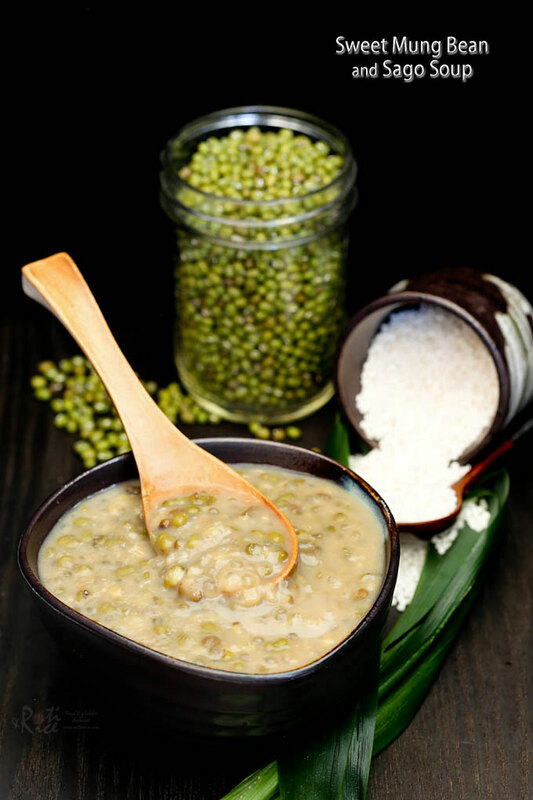 Split and hulled mung beans are light yellow in color and often made into a paste for pancakes or filling. Mung bean starch is extracted to make transparent cellophane noodles, also known as bean threads or glass noodles. 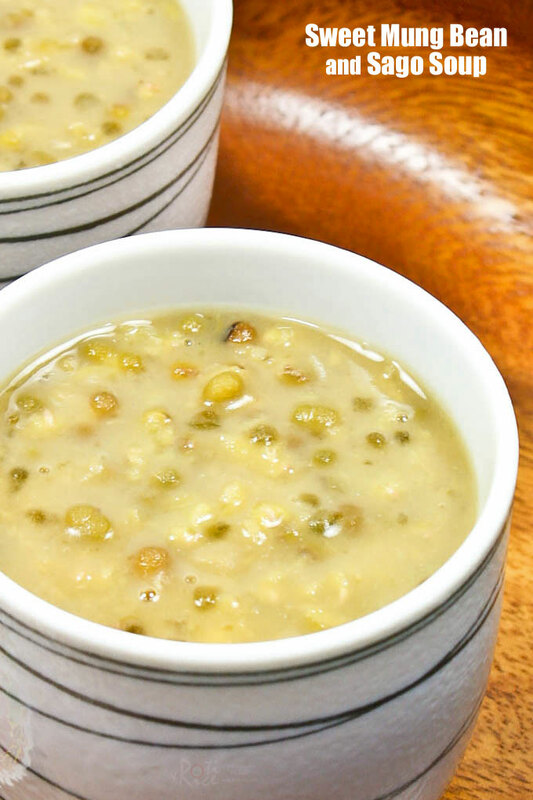 Sweet Mung Bean and Sago Soup is considered cooling and is very easy to prepare. They cook a little faster than red or adzuki beans. The addition of pandan leaves, sago, and coconut milk is a Southeast Asian enhancement to the Chinese original. Please also check out my Sweet Red Bean Soup recipe. In a large pot, combine mung beans, brown sugar, water, and pandan leaves. Bring to a boil, redude heat and allow to simmer for 30 minutes or until mung bean splits open. Add sago pearls and coconut milk. Simmer for another 8 minutes or until sago pearls turn translucent. Add a little water if soup gets too thick. **Please adjust sweetness according to taste. NOTE: New pictures were added to this post on April 14th, 2016. Never tried a sweet soup before… I like the sound of green beans, so will give this a go too.. sounds really interesting! I love sago…In India we have it cooked with potatoes and peanuts as savoury and with milk and sugar for a dessert. I’ll have to give this soup a go. Love the healthy and filling lentil soup! I love this, Biren. My husband likes it with coconut milk. I like it with milk. Comfort food. Wow, I have never had anything quite like this, especially for dessert! I loved reading about it. Thanks. I’ve never had soup like this. It looks so good! I’d never heard of Sago too, thanks for the education:-). Your photo came out beautifully! Sago pearls are similar to tapioca pearls and can be used interchangeably although they are made from different starches. Sago is extracted from the sago palm. This is another sweet soup that reminds me of childhood days! Unfortunately my boys are not into this so I don’t get to eat this as often as I would like. Didn’t know this is called mung bean soup 🙂 We just call it green bean soup & hubby loves this. Have u tried adding rice in it? Some people add little grains of rice into this dessert. No, I have never tried addig rice to it. I imagine it must be like a porridge. This looks so interesting, I want to try it! Biren you are always introducing me to great new dishes. Biren, thank you for sharing this: I have so much to learn about Chinese cuisine. This sweet soup looks so different – I’d love to try it, warm or cold sounds equally fabulous. The weather here continues to be unpredictable. Spring was cold and this summer has been exceptionally rainy. I needed something familiar and this dessert came to mind. This is my mom’s concoction with coconut milk and sago and I love it. Boys are not too keen on tong sui but I’m making it for me. Oh, I can imagine the sweltering tropical heat. Just thinking of it makes me perspire. Definitely a chilled version is preferred over there. I never knew how this was made – my dad loves this stuff! I really love the idea of soup as dessert! This sounds incredibly delicious! Hmmmm…I love sweet mung bean soup. In the Philippines, we use evaporated milk. Haven’t tried it with sago, but I’m sure it tastes even better. You just tempted me to make some tong sui tomorrow. Yummm…. Have a lovely day. One of the must-have in hot and humid summer days after an afternoon nap! This looks very interesting, I’ve never had it before. Do you eat it as a dessert? It would be fun to try! This is pretty cool! I’ve never had a dessert soup before. Looks pretty easy to do too 🙂 Thanks for sharing! 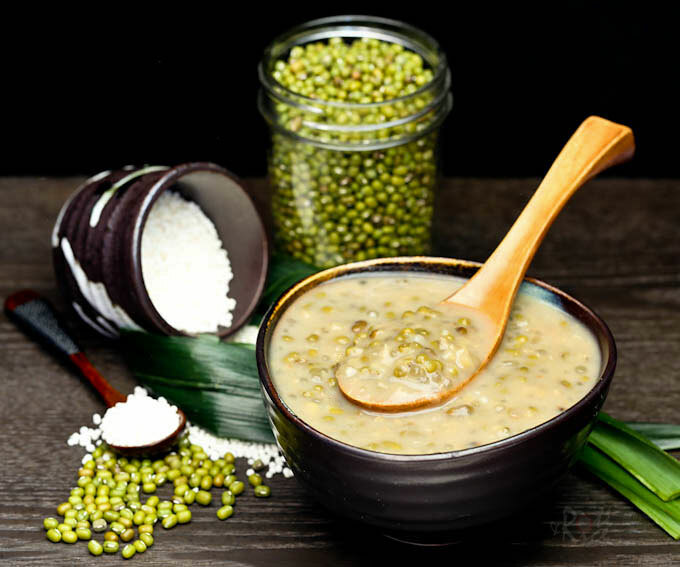 ahhhhhh….Mung beans porridge… my all time favourite. Biren, really?! I didn’t know that something like this even exists…we have the usual “dal” always…but this sweet soup sounds so unique! How interesting! Sounds yummy… also what are pandan leaves? One of my family’s favourites! Love it warm and good when cold too! Biren, I haven’t had this in a while because I’m waiting for my mum to make it! Can you believe after years of eating this lovely dessert, I have yet to cook it myself? I like it with both pandan and santan flavors, and I like to eat it cold ;-). Gotta call my mum…. I love sweet mung bean soup though I’ve never tried sago in it. Great idea! This is my goto dessert when I need something sweet and warm. It is especially good with the coconut milk and sago. The coconut milk is actually optional but I much prefer to add it in. I love mung bean but I haven’t tried it sweet. Though we have a sweet version too but I don’t know why i haven’t tried it so far. Im sure I will like this kind too. how can i tell if the sugar is gula melaka? I live in canada and gula melaka is hard to find! Gula Melaka usually comes in solid cylinders but unfortunately it is hard to tell if it is not labeled. Any palm sugar or brown sugar would work for this recipe. Any substitute for pandan leaves as i don’t have? I am afraid there is no substitute for pandan in this particular recipe. You can certainly omit it totally and it will still taste good though not as fragrant. I just made this. Every now and then I crave for my local dessert. My daughter didn’t like it then but today she tried again and ate two bowls of it. She gave me a thumbs up. I added two piece of clove just like the way my mom makes it. Hi Linda, I am just wondering should I use orange peels to increase the flavour?? and also does the sago become a hard texture after it is refrigerated? Orange peels work better with Sweet Red Bean Soup. No, the sago will not become hard since it is immerse in liquid.